There was something about Ripon College that captured the attention of a young Michael Timm ’04 while sorting through college mailers. He found a “charm” in the private college which prompted a visit. “I visited the campus and liked the feel of the place, the casual humility of the people,” he says. “I interviewed with Paul Axelrod, then chair of the anthropology department, who would later become my adviser. I liked him. It was also clear he liked me. “Going to Ripon meant I quickly became an integral part of a small community, for better or worse, and that led to bonds, relationships and responsibilities that made me grow as a human being,” Timm says. He also was offered a Pickard Scholarship that put Ripon financially on par with his other top choice, the University of Wisconsin-Madison. “Ripon offered the opportunity to participate in an intimate community that would challenge me socially,” he says. At Ripon, Timm majored in anthropology and English and was on the editorial board of the College Days student newspaper. “I learned how communities functioned, how all politics is local, and how to slog through perspectives and details to formulate a story. I learned to listen, inquire, critique, think, and write for public audiences,” he says. His passion for journalism stemmed into a career, as he worked as a contributor, assistant editor and eventual editor of Bay View Compass, an independent monthly newspaper serving Milwaukee’s Bay View neighborhood and surrounding communities. He also has written business history books and managed a suite of niche writing, editing and design clients. He went on to earn a master’s degree from the University of Wisconsin-Milwaukee School of Freshwater Sciences in 2013. 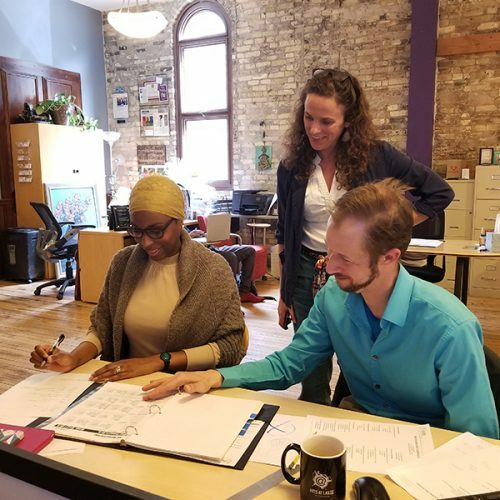 He now manages the Milwaukee Water Stories program for the small entrepreneurial nonprofit Reflo Sustainable Water Solutions. “We’re changing the world by creating urban green infrastructure projects that rewrite Milwaukee’s water story,” he says. On weekends, Timm works at the reference desk at the Cudahy Family Library, a side job he picked up during graduate school but has kept because he enjoys the people and believes in the mission. Check out this short one-minute video about Timm’s work. Posted November 26, 2018 in Alumni by Jaye Alderson.